Eleanor K. Viviano, 84 of Toledo, passed away on Friday, December 15, 2017 at University of Toledo Medical Center after a brief illness. Eleanor was born in Mt. Pleasant, Michigan on February 24, 1933 to John and Kathyrn (Hyde) Keyser. After graduating with a bachelor’s degree from Michigan State University she married Sam Viviano on July 2, 1955 in Detroit, Michigan. In 1964, the family left Detroit and moved to Waterville, OH where she raised her young family and was an active member of Waterville Playshop. During that time, Ellie also enjoyed working in the family flower business, Bartz Viviano Flowers and Gifts. Ellie loved the arts and expressed herself through painting, writing, and acting. She was also an accomplished gourmet chef and will be remembered for the wonderful dishes she prepared for family gatherings and for sharing her cooking skills with her daughters and daughters-in-law. Ellie was a nature lover at heart and throughout her life she showed a deep appreciation for God’s creation. She spent the last 20 years living in her own home in South Toledo where her love for gardening became her passion. She transformed her yard into a rich tapestry of beautiful flowers and plants that culminated in winning the award for the Best Perennial Garden in Toledo in 2011. She was also a longtime member of the Garden Club and enjoyed her weekly painting group. 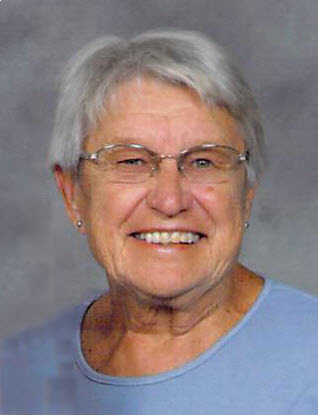 She was an avid golfer and played in ladies golf leagues for many years. In all her endeavors Ellie will be remembered for always striving to be her best. Her passion for excellence will always be an inspiration to her family. Her grandchildren were her joy, each one was welcomed with delight into her arms and heart. All the kids in her life whether hers or not, called her Grandma Ellie. Ellie left a rich legacy to her 6 children, 20 grandchildren and 2 great-grandchildren. She was preceded in death by her mother, Kathryn; father, John, and brothers, Randall and Jack. She is survived by her sister, Molly and children, Kathy Hauck (Jim), Frank (Sandy), Sam (Judy), Marisa Johnson (Steve), Julie Sofo (Mike), and Matthew (Donna). Following Eleanor’s wishes there will be no visitation. There will be a Mass in her honor on December 26th at 11 a.m. at Blessed Sacrament Church, 2240 Castlewood Dr., Toledo, OH 43613. We also invite family and friends to join us for a Celebration of Ellie’s life on December 26th from 1 to 4 p.m. at Hilton Garden Inn, 6165 Levis Commons Blvd., Perrysburg, OH 43551. Arrangements by Eggleston Meinert & Pavley Funeral Home. Alice A. (Arthur) Brandel was born on March 24, 1926 to Ralph and Genevieve Arthur in Toledo, Ohio. Alice graduated from Central Catholic High School in 1943. She was employed at Autolite where she met her husband, William F. Brandel whom she married June 17, 1950. Bill and Alice enjoyed gathering with many friends in Fort Myers every winter. They traveled to all 50 states and over a dozen countries. She was active in the OLPH Altar Society, and very involved in her children’s school activities. She is survived by her loving children, Marcia (Mike) Linenkugel, Jan Konrad, Connie (Vince) Curtis, Bill (Sue) Brandel; and sisters-in-law, Pat Arthur and Pat Brandel. Alice was also deeply loved by her grandchildren, Lisa King, Ryan Konrad, Christi Ansberg, Eric Walter, Kelly Biggs, Nathan Konrad, Andrew Velker, David Brandel, Sharilyn Brandel, Mike Curtis, Greg Curtis, Rob Linenkugel, Mike Linenkugel, and Julie Emerson; and her 27 great-grandchildren. She was preceded in death by her husband, Bill; her brothers, Ralph, Ray and Richard; and her grandson, Charles Curtis. Irene Janet (Kotynski) McCartney of Geneseo, IL passed away peacefully on December 9th, 2017 with family members by her side. Services will be held on Thursday, December 21 at St. Malachy Catholic Church in Geneseo. The visitation will be from 9:30 (rosary at 9:30 a.m.) to 10:30 a.m. in the church followed by the Funeral Mass at 10:30 a.m. There will be a luncheon in the church hall following the Mass. In lieu of flowers, please make a donation in Irene’s name to the Geneseo Food Pantry, 217 North Russell Street, Geneseo, IL 61254. Vandemore Funeral Home & Crematory is assisting the family with arrangements. Irene was born to the late Anastazy S. and Janet (Jaskulska) Kotynski in 1926 at St. Mary of Nazareth Hospital, Chicago, IL. She was baptized at St. Joseph Catholic Church, Hammond, IN. Her godmother was Cecilia (Chessia) Glazer. Irene attended St. Joseph Grade School and graduated from Hammond High School. Irene worked at a Naval Office in South Chicago and at Hammond City Hall as secretary to the City Engineer. Irene married the love of her life, Michael John McCartney, Jr. in 1950. Witnesses at her marriage were her brother Edward S. Kotynski and Michael’s sister, Gertrude A. McCartney. Their first three children were born in Hammond, IN – Michael III, Mary and Regina. Michael took a job with Detroit Testing Lab and Irene had the next three children while living in Detroit – Chris, Maureen and John. Their youngest child, Marie, was born in Toledo when Michael took a position with Owens-Illinois. Michael and Irene raised their family in South Toledo, attending Our Lady of Perpetual Help Catholic Church where both were very active in the church and community. They spent time making and maintaining numerous friendships that lasted a lifetime. Irene was particularly fond of her birthday club and her Weight Watchers group (they met after meetings for lunch and joked about how they “watched” as their “weight” went up!) After Michael retired from O-I, Irene and Michael moved to Chickasha, OK and lived there until Michael passed away in 2008 after 58 years of marriage. Irene moved to Geneseo in 2009 and to the Good Samaritan Nursing Village in Geneseo in 2017. After Irene and Michael retired, they had calling cards printed with the phrase, “We have lived fully; We have loved well.” Michael and Irene certainly did! She was preceded in death by her husband, Michael, Jr.; her parents, Anastazy S. and Janet (Jaskulska) Kotynski and her brothers, Edward, Henry and George. She is survived by seven children, Michael III (Joie Zatko), Schererville, IN, Mary, Owatonna, MN, Regina (Al) Sutherland, Chickasha, OK, Chris, McCook, NE, Maureen (Robert) Hall, Pfafftown, NC, John (Sally Lonsdale) of St. Petersburg, FL and Marie (Kevin) Lillis, Geneseo. She is also survived by 19 grandchildren and 14 great-grandchildren. The burial will take place on January 6, 2018, in Chickasha, OK at the Fairlawn Cemetery (Grady County, OK) next to her husband of 58 years, Michael, Jr. Mother of Karen ’76, Sharon ’79 and Laura and Linda ’84 Kotula passed away. Having lived a life of humble service and lifelong commitment to others, Betty Jane Kotula, Perrysburg Ohio, age 88 left this earthly life on Sunday, December 3, 2017 at Otterbein Portage Valley. She was born and named Elizabeth Jane on June 1, 1929 to Ernest and Carrie (Dlugiewicz) Jakubowski in Toledo, Ohio. She married Gerald P. Kotula on October 19, 1957 at St. Adalbert’s Church, Toledo. Betty was a graduate of Woodward High School and subsequently worked at the Rossford Ordnance Depot until the birth of her girls. She remained a selfless servant to her church, family, friends, and neighbors during her entire life. During the 80’s, she was employed by the Frank School cafeteria in Perrysburg. Upon retirement she and Gerald enjoyed time at their winter home in Panama City Beach, Florida. Betty was preceded in death by her parents; Brothers Edward, Arthur, John, Walter and Daniel. She is survived by her husband of 60 years, Gerald; sisters Rose Bogdanski, Sister Sandra Jakubowski; brothers Paul and Melvin; daughters Karen (Scott) Schwind, Sharon (Bill) Brinker, Laura (Paul) Brady and Linda Melvin; ten very special grandchildren, Lesley Bevil, Eric and Adam Schwind, Rob Groves, Aaron and Jared Brinker, John Paul and Allison Brady, Kate and Jake Melvin; and 5 great grandchildren. Many thanks to her caregivers Kathy Ringler and Janet Aldrich, Otterbein staff and Hospice staff. A gathering of family and friends will take place at St. Rose Church, Perrysburg on Saturday December 9, 2017 beginning at 9:30 AM. A funeral Mass will be held at 11:00 AM in the church followed by a luncheon. A private burial at St. Rose Cemetery will be held at a later date. Gifts in memorium should be directed to St. Rose Parish, Hospice of Northwest Ohio or Otterbein Portage Valley Senior Lifestyles. Just enjoying our life in retirement. We are traveling and enjoying our family and our hobbies. Question #1: McAuley Impact… ? : Absolutely! High Level of education, great teachers and classmates. Learned so much more than academics – about relationships, love, respect, civic duty, giving back and teamwork. Question #2: How did you come to choose McAuley…? : I was supposed to go to St. Ursula, where my sister graduated. Our family moved closer to OLPH and McAuley. I loved it from the start and had a wonderful 4 years there! Daniel J. Richardson, former Toledo resident, passed away from complications of dementia at home in Columbus, OH on December 7, 2016. Dan was born in Detroit on May 27, 1949. He spent his early years in Farmington, MI and moved to Toledo at age 12. Dan graduated from Central Catholic High School. He married Cathy Olszanski September 17, 1971 in Washington, D.C., where he served in the Army at Walter Reed Hospital. After his discharge, they returned to Toledo where they lived until moving to Columbus in 2014. Dan retired from MCO where he worked for 30 years as a respiratory therapist. He attended UT and earned an Associate Degree from Northwestern University Medical School. Dan was an avid bowler who rolled two 300 games. He enjoyed music, golf, making people laugh, and bragging about his children. He remained a lifelong Michigander at heart, loyally supporting all Detroit and U of M sports teams. Dan was preceded in death by his parents, Anne and Frank, and brother, Paul. He is survived by his wife; children, Lindsay (Randy) Parks, Erin (Brent) Welch, and Michael (Shawn Weyrich), and grandchildren, Macy, Natalie, Hailey, and Annie Welch and Asher and Zachary Parks.